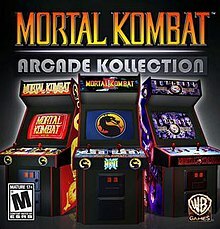 Mortal Kombat Arcade Kollection is a 2011 video game developed by NetherRealm Studios and Other Ocean Interactive and published by Warner Bros. Games. It is a compilation of three classic 2D fighting games in the Mortal Kombat series: Mortal Kombat (1992), Mortal Kombat II (1993) and Ultimate Mortal Kombat 3 (1995). The game was created after an ambitious previous incarnation, an HD remake project titled Mortal Kombat HD Arcade Kollection, was cancelled. Arcade Kollection was released as a downloadable title for PlayStation 3 and Xbox 360 on August 31, 2011 and for the PC on February 1, 2012. The game is a compilation of the first three Mortal Kombat games. Along with a few very minor changes to them, it features online multiplayer, pause menus, achievements, also making unlockable characters always available in online mode. The game was originally conceived as an HD remake of the early Mortal Kombat games, featuring remade character sprites, new backgrounds and new user interface system, before the scope of the project was changed. Known as Mortal Kombat HD Arcade Kollection, it was supposed to be made by Other Ocean Interactive, the studio that has created Ultimate Mortal Kombat for the Nintendo DS. This canceled project was never even officially announced before it was canceled, and a simple compilation of original games was released instead of it, also created by Other Ocean. Graphical assets, such as Zbrush models for the Animalities and Mileena's unmasked, face have been since leaked by the artist Jeremy Kohar in 2013. Previously, more concept art from the project were revealed by the artist John Montenegro. In 2014, make-up artist Tanea Brooks released pictures of herself helping the new actors for Liu Kang, Kitana, Kung Lao, Shao Kahn and Sonya Blade prepare for a shooting session for HD Kollection. Another attempt at re-editing the original trilogy in HD was made by Blind Squirrel Games, but was also cancelled before it came to be. The game received generally mixed or average reviews. ^ a b "The Art of John Montenegro: "Mortal Kombat: Arcade Kollection" UI Work". Jwmontenegro.blogspot.com. Archived from the original on 2013-10-08. Retrieved 2013-08-22. ^ "Mortal Kombat: HD Arcade Kollection for PlayStation 3". GameFAQs. Retrieved 2013-08-22. ^ a b "Mortal Kombat Arcade Kollection HD Was In The Works, Warner Bros. Kanned It". Siliconera. 2013-07-03. Retrieved 2013-08-22. ^ "Mortal Kombat Arcade Kollection Review / Xbox World Australia | Xbox 360". Xboxworld.com.au. Retrieved 2013-08-22. ^ "Images From Kanceled Mortal Kombat Kollection HD Surface". Arcadesushi.com. Retrieved 2014-05-07. ^ "Ultimate cosplay? Photos of Kitana, Sonya, Liu Kang and more surface in full costume for cancelled HD remake of Mortal Kombat". Eventhubs.com. Retrieved 2014-05-07. ^ "Blind Squirrel was indeed working on Mortal Kombat Remaster but it was cancelled, first screenshots". ^ "Mortal Kombat Arcade Kollection for Xbox 360". GameRankings. 2011-08-31. Retrieved 2013-08-22. ^ "Mortal Kombat Arcade Kollection for PlayStation 3". GameRankings. 2011-08-31. Retrieved 2013-08-22. ^ "Mortal Kombat Arcade Kollection for Xbox 360 Reviews". Metacritic. 2011-08-31. Retrieved 2013-08-22. ^ "Mortal Kombat Arcade Kollection for PlayStation 3 Reviews". Metacritic. 2011-08-31. Retrieved 2013-08-22.